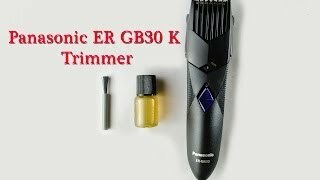 Now get the easy and trendy beard up to 3 days in only one shave with Panasonic ER-GB30A Men’s Battery Operated Trimmer, which is designed with Japanese blade technology. The device is battery operated that are not rechargeable. Get smooth cutting with its a 45° edge. Durable stainless steel blades having a 45° edge enables precise cutting edge. Sharp cutting edges immediately cut thick and difficult beard. With Quick Adjust Dial shave and comb with the single device. Twist the dial to readily fix comb down and up into 9 configurations from 2-18mm. No requirement for several comb attachments. Panasonic ER-GB30A Men’s Battery Operated Trimmer drain enables water to flow freely throughout the device to get a fast and easy clean. Disclaimer: Sharpdeals believes in selling only world class branded products hence all the products may or may not carry the warranty which is a manufacturer sponsored. Any claim or dispute is subject to jurisdiction of the court where store head office is situated. Images are for reference purpose only color, MRP or model name may change according to the company policy with or without any prior acknowledgement.